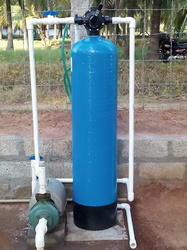 Providing you the best range of water softener with effective & timely delivery. Water softening is the removal of calcium, magnesium, and certain other metal cations in hard water. The resulting soft water requires less soap for the same cleaning effort, as soap is not wasted mopping up calcium ions. Soft water also extends the lifetime of plumbing by reducing or eliminating scale build-up in pipes and fittings. Water softening is usually achieved using lime softening or ion-exchange resins.We hold expertise in offering a wide range of Water Softener. These are exclusively designed as per international industrial standards. Owing to its application specific construction and effective usage, these products are widely recommended by large numbers of clients. Following the precise demands of clients, we offer these products in various specifications. Looking for Water Softener ?